Optimierungsprobleme in der Energiewirtschaft befassen sich mit der Produktionsplanung und Verteilung verschiedener Energieträger (Strom, Gas) zur Deckung eines gegebenen Kundenbedarfs. Hierbei stellt die Betrachtung von Transportnetzwerken, von Unsicherheiten (Bedarf, Preis, meteorologische Parameter) sowie von Marktgleichgewichten besondere mathematische Herausforderungen dar. Der Schwerpunkt der Anwendungen liegt auf dem optimalen Management von Wasserreservoirs bei zufälligen Zuflüssen sowie auf Fragen der Optimierung in Gasnetzwerken bei unsicheren Lasten, wie etwa der Maximierung technischer Kapazitäten durch einen Gasnetzwerkbetreiber. Involvierte mathematische Disziplinen sind vornehmlich die stochastische und nichtglatte Optimierung. Die Modellierung unsicherer Parameter in den Nebenbedingungen solcher Optimierungsprobleme führt auf die Betrachtung sogenannter Wahrscheinlichkeitsrestriktionen, die sicherstellen, dass eine getroffene kostenoptimale Entscheidung zugleich robust im Sinne hoher Wahrscheinlichkeit gegenüber späteren Realisierungen des Zufalls sind. Die effiziente algorithmische Behandlung von Wahrscheinlichkeitsrestriktionen in den genannten Fragestellungen bildet den Schwerpunkt dieses Anwendungsthemas. Die Forschungstätigkeit auf dem Gebiet von Optimierungsproblemen unter Wahrscheinlichkeitsrestriktionen führte zu einer intensiven Kooperation mit EDF (Electricité de France), was insbesondere in ein von der Fondation Mathématique Jacques Hadamard gefördertes Forschungsprojekt mündete. Hierbei besteht das Wasserkraftmanagement unter stochastischen Füllstandsrestriktionen für Reservoirs bzw. Bedarfsrestriktionen im Vordergrund. Darüberhinaus werden geeignete Modelle mit Wahrscheinlichkeitsrestriktionen in einem SFB/Transregioprojekt zu Optimierungsproblemen in Gasnetzwerken mit unsicheren Lasten angewandt. Im Zusammenhang mit diesen Arbeiten steht die Mitautorenschaft an der im SIAM-Verlag erschienen Monographie 'Evaluating Gas Network Capacities', die den 'EURO Excellence in Practice Award 2016' verliehen bekam. L. Ghezzi, D. Hömberg, Ch. Landry, eds., Math for the Digital Factory, 27 of Mathematics in Industry / The European Consortium for Mathematics in Industry, Springer International Publishing AG, Cham, 2017, x+348 pages, (Collection Published), DOI 10.1007/978-3-319-63957-4 . H. Heitsch, R. Henrion, H. Leövey, R. Mirkov, A. Möller, W. Römisch, I. Wegner-Specht, Chapter 13: Empirical Observations and Statistical Analysis of Gas Demand Data, in: Evaluating Gas Network Capacities, Th. Koch, B. Hiller, M.E. Pfetsch, L. Schewe, eds., MOS-SIAM Series on Optimization, SIAM, Philadelphia, 2015, pp. 273--290, (Chapter Published). B. Hiller, Ch. Hayn, H. Heitsch, R. Henrion, H. Leövey, A. Möller, W. Römisch, Chapter 14: Methods for Verifying Booked Capacities, in: Evaluating Gas Network Capacities, Th. Koch, B. Hiller, M.E. Pfetsch, L. Schewe, eds., MOS-SIAM Series on Optimization, SIAM, Philadelphia, 2015, pp. 291--315, (Chapter Published). M. Eigel, J. Neumann, R. Schneider, S. Wolf, Risk averse stochastic structural topology optimization, Computer Methods in Applied Mechanics and Engineering, 334 (2018), pp. 470--482, DOI 10.1016/j.cma.2018.02.003 . A novel approach for risk-averse structural topology optimization under uncertainties is presented which takes into account random material properties and random forces. For the distribution of material, a phase field approach is employed which allows for arbitrary topological changes during optimization. The state equation is assumed to be a high-dimensional PDE parametrized in a (finite) set of random variables. For the examined case, linearized elasticity with a parametric elasticity tensor is used. Instead of an optimization with respect to the expectation of the involved random fields, for practical purposes it is important to design structures which are also robust in case of events that are not the most frequent. As a common risk-aware measure, the Conditional Value at Risk (CVaR) is used in the cost functional during the minimization procedure. Since the treatment of such high-dimensional problems is a numerically challenging task, a representation in the modern hierarchical tensor train format is proposed. In order to obtain this highly efficient representation of the solution of the random state equation, a tensor completion algorithm is employed which only required the pointwise evaluation of solution realizations. The new method is illustrated with numerical examples and compared with a classical Monte Carlo sampling approach. L. Adam, M. Branda, H. Heitsch, R. Henrion, Solving joint chance constrained problems using regularization and Benders' decomposition, Annals of Operations Research, (2018), published online on 08.11.2018, DOI 10.1007/s10479-018-3091-9 . In this paper we investigate stochastic programms with joint chance constraints. We consider discrete scenario set and reformulate the problem by adding auxiliary variables. Since the resulting problem has a difficult feasible set, we regularize it. To decrease the dependence on the scenario number, we propose a numerical method by iteratively solving a master problem while adding Benders cuts. We find the solution of the slave problem (generating the Benders cuts) in a closed form and propose a heuristic method to decrease the number of cuts. We perform a numerical study by increasing the number of scenarios and compare our solution with a solution obtained by solving the same problem with continuous distribution. We present a novel mathematical algorithm to assist gas network operators in managing uncertainty, while increasing reliability of transmission and supply. As a result, we solve an optimization problem with a joint probabilistic constraint over an infinite system of random inequalities. Such models arise in the presence of uncertain parameters having partially stochastic and partially non-stochastic character. The application that drives this new approach is a stationary network with uncertain demand (which are stochastic due to the possibility of fitting statistical distributions based on historical measurements) and with uncertain roughness coefficients in the pipes (which are uncertain but non-stochastic due to a lack of attainable measurements). We study the sensitivity of local uncertainties in the roughness coefficients and their impact on a highly reliable network operation. In particular, we are going to answer the question, what is the maximum uncertainty that is allowed (shaping a 'maximal' uncertainty set) around nominal roughness coefficients, such that random demands in a stationary gas network can be satisfied at given high probability level for no matter which realization of true roughness coefficients within the uncertainty set. One ends up with a constraint, which is probabilistic with respect to the load of gas and robust with respect to the roughness coefficients. We demonstrate how such constraints can be dealt with in the framework of the so-called spheric-radial decomposition of multivariate Gaussian distributions. The numerical solution of a corresponding optimization problem is illustrated. The results might assist the network operator with the implementation of cost-intensive roughness measurements. We consider the identification of a nonlinear friction law in a one-dimensional damped wave equation from additional boundary measurements. Well-posedness of the governing semilinear hyperbolic system is established via semigroup theory and contraction arguments. We then investigate the inverse problem of recovering the unknown nonlinear damping law from additional boundary measurements of the pressure drop along the pipe. This coefficient inverse problem is shown to be ill-posed and a variational regularization method is considered for its stable solution. We prove existence of minimizers for the Tikhonov functional and discuss the convergence of the regularized solutions under an approximate source condition. The meaning of this condition and some arguments for its validity are discussed in detail and numerical results are presented for illustration of the theoretical findings. S. Hajian, M. Hintermüller, S. Ulbrich, Total variation diminishing schemes in optimal control of scalar conservation laws, IMA Journal of Numerical Analysis, published online on 14.12.2017, urlhttps://doi.org/10.1093/imanum/drx073, DOI 10.1093/imanum/drx073 . In this paper, optimal control problems subject to a nonlinear scalar conservation law are studied. Such optimal control problems are challenging both at the continuous and at the discrete level since the control-to-state operator poses difficulties as it is, e.g., not differentiable. Therefore discretization of the underlying optimal control problem should be designed with care. Here the discretize-then-optimize approach is employed where first the full discretization of the objective function as well as the underlying PDE is considered. Then, the derivative of the reduced objective is obtained by using an adjoint calculus. In this paper total variation diminishing Runge-Kutta (TVD-RK) methods for the time discretization of such problems are studied. TVD-RK methods, also called strong stability preserving (SSP), are originally designed to preserve total variation of the discrete solution. It is proven in this paper that providing an SSP state scheme, is enough to ensure stability of the discrete adjoint. However requiring SSP for both discrete state and adjoint is too strong. Also approximation properties that the discrete adjoint inherits from the discretization of the state equation are studied. Moreover order conditions are derived. In addition, optimal choices with respect to CFL constant are discussed and numerical experiments are presented. We address the problem of optimally placing sensor networks for convection-diffusion processes where the convective part is perturbed. The problem is formulated as an optimal control problem where the integral Riccati equation is a constraint and the design variables are sensor locations. The objective functional involves a term associated to the trace of the solution to the Riccati equation and a term given by a constrained optimization problem for the directional derivative of the previous quantity over a set of admissible perturbations. The paper addresses the existence of the derivative with respect to the convective part of the solution to the Riccati equation, the well-posedness of the optimization problem and finalizes with a range of numerical tests. H. Heitsch, H. Leövey, W. Römisch, Are quasi-Monte Carlo algorithms efficient for two-stage stochastic programs?, Computational Optimization and Applications. An International Journal, 65 (2016), pp. 567--603. Quasi-Monte Carlo algorithms are studied for designing discrete approximations of two-stage linear stochastic programs with random right-hand side and continuous probability distribution. The latter should allow for a transformation to a distribution with independent marginals. The two-stage integrands are piecewise linear, but neither smooth nor lie in the function spaces considered for QMC error analysis. We show that under some weak geometric condition on the two-stage model all terms of their ANOVA decomposition, except the one of highest order, are continuously differentiable and that first and second order ANOVA terms have mixed first order partial derivatives. Hence, randomly shifted lattice rules (SLR) may achieve the optimal rate of convergence not depending on the dimension if the effective superposition dimension is at most two. We discuss effective dimensions and dimension reduction for two-stage integrands. The geometric condition is shown to be satisfied almost everywhere if the underlying probability distribution is normal and principal component analysis (PCA) is used for transforming the covariance matrix. Numerical experiments for a large scale two-stage stochastic production planning model with normal demand show that indeed convergence rates close to the optimal are achieved when using SLR and randomly scrambled Sobol' point sets accompanied with PCA for dimension reduction. C. Gotzes, H. Heitsch, R. Henrion, R. Schultz, On the quantification of nomination feasibility in stationary gas networks with random load, Mathematical Methods of Operations Research, 84 (2016), pp. 427--457. The paper considers the computation of the probability of feasible load constellations in a stationary gas network with uncertain demand. More precisely, a network with a single entry and several exits with uncertain loads is studied. Feasibility of a load constellation is understood in the sense of an existing flow meeting these loads along with given pressure bounds in the pipes. In a first step, feasibility of deterministic exit loads is characterized algebraically and these general conditions are specified to networks involving at most one cycle. This prerequisite is essential for determining probabilities in a stochastic setting when exit loads are assumed to follow some (joint) Gaussian distribution when modeling uncertain customer demand. The key of our approach is the application of the spheric-radial decomposition of Gaussian random vectors coupled with Quasi Monte-Carlo sampling. This approach requires an efficient algorithmic treatment of the mentioned algebraic relations moreover depending on a scalar parameter. Numerical results are illustrated for different network examples and demonstrate a clear superiority in terms of precision over simple generic Monte-Carlo sampling. They lead to fairly accurate probability values even for moderate sample size. I. Bremer, R. Henrion, A. Möller, Probabilistic constraints via SQP solver: Application to a renewable energy management problem, Computational Management Science, 12 (2015), pp. 435--459. The aim of this paper is to illustrate the efficient solution of nonlinear optimization problems with joint probabilistic constraints by means of an SQP method. Here, the random vector is assumed to obey some multivariate Gaussian distribution. The numerical solution approach is applied to a renewable energy management problem. We consider a coupled system of hydro and wind power production used in order to satisfy some local demand of energy and to sell/buy excessive or missing energy on a day-ahead and intraday market, respectively. A short term planning horizon of 2 days is considered and only wind power is assumed to be random. In the first part of the paper, we develop an appropriate optimization problem involving a probabilistic constraint reflecting demand satisfaction. Major attention will be payed to formulate this probabilistic constraint not directly in terms of random wind energy produced but rather in terms of random wind speed, in order to benefit from a large data base for identifying an appropriate distribution of the random parameter. The second part presents some details on integrating Genz' code for Gaussian probabilities of rectangles into the environment of the SQP solver SNOPT. The procedure is validated by means of a simplified optimization problem which by its convex structure allows to estimate the gap between the numerical and theoretical optimal values, respectively. In the last part, numerical results are presented and discussed for the original (nonconvex) optimization problem. A. Fügenschuh, B. Geissler, Ch. Hayn, R. Henrion, B. Hiller, J. Humpola, Th. Koch ET AL., Mathematical optimization for challenging network planning problems in unbundled liberalized gas markets, Energy Systems, 5 (2014), pp. 449--473. 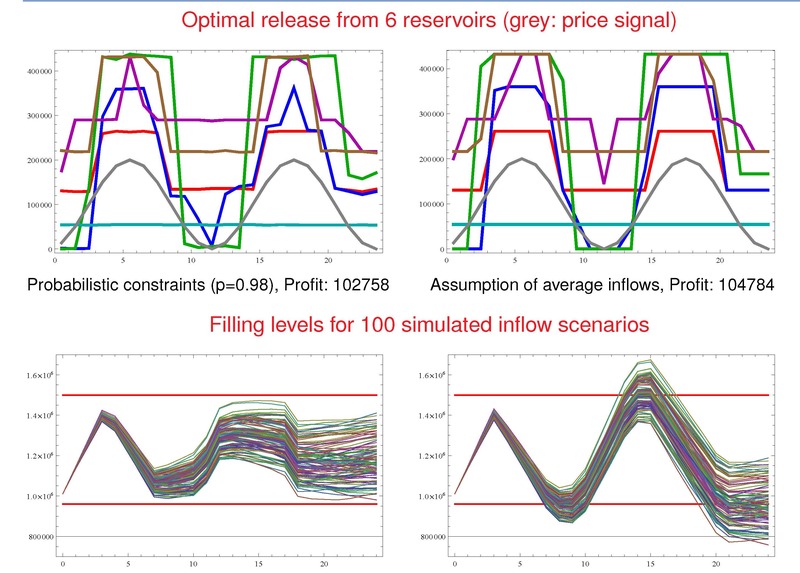 W. VAN Ackooij, R. Zorgati, R. Henrion, A. Möller, Joint chance constrained programming for hydro reservoir management, Optimization and Engineering. International Multidisciplinary Journal to Promote Optimization Theory & Applications in Engineering Sciences, 15 (2014), pp. 509--531. R. Henrion, W. Römisch, On M-stationary points for a stochastic equilibrium problem under equilibrium constraints in electricity spot market modeling, Applications of Mathematics, 522 (2007), pp. 473--494. Modeling several competitive leaders and followers acting in an electricity market leads to coupled systems of mathematical programs with equilibrium constraints, called equilibrium problems with equilibrium constraints (EPECs). We consider a simplified model for competition in electricity markets under uncertainty of demand in an electricity network as a (stochastic) multi-leader-follower game. First order necessary conditions are developed for the corresponding stochastic EPEC based on a result of Outrata . For applying the general result an explicit representation of the co-derivative of the normal cone mapping to a polyhedron is derived (Proposition 3.2). Later the co-derivative formula is used for verifying constraint qualifications and for identifying M-stationary solutions of the stochastic EPEC if the demand is represented by a finite number of scenarios. TH. Arnold, R. Henrion, M. Grötschel, W. Römisch ET AL., B4 -- A Jack of all trades? Solving stochastic mixed-integer nonlinear constraint programs, in: MATHEON -- Mathematics for Key Technologies, M. Grötschel, D. Hömberg, J. Sprekels, V. Mehrmann ET AL., eds., 1 of EMS Series in Industrial and Applied Mathematics, European Mathematical Society Publishing House, Zurich, 2014, pp. 135--146. H. Heitsch, R. Henrion, Ch. Küchler, W. Römisch, Generierung von Szenariobäumen und Szenarioreduktion für stochastische Optimierungsprobleme in der Energiewirtschaft, in: Dezentrale regenerative Energieversorgung: Innovative Modellierung und Optimierung, R. Schultz, H.-J. Wagner, eds., LIT Verlag, Münster, 2009, pp. 227--254. L. Adam, M. Branda, H. Heitsch, R. Henrion, Solving joint chance constrained problems using regularization and Benders' decomposition, Preprint no. 2471, WIAS, Berlin, 2018, DOI 10.20347/WIAS.PREPRINT.2471 . I. Bremer, Using an SQP-solver for nonlinear optimization under probabilistic constraints, 100th Meeting of the GOR Working Group ``Real World Mathematical Optimization'', April 12 - 13, 2018, Regenstauf, April 12, 2018. A. Caiazzo, Mathematical modeling and simulations of geothermal reservoirs, Leibniz-Institut für Angewandte Geophysik, Hannover, November 7, 2018. R. Henrion, Maximization of free capacities in gas networks with random load, Conference ``Variational Analysis -- Challenges in Energy'', June 4 - 6, 2018, Castro Urdiales, Spain, June 4, 2018. M. Hintermüller, Generalised Nash equilibrium problems with partial differential equations, Search Based Model Engineering Workshop, August 7 - 9, 2018, King's College London, UK, August 7, 2018. M. Hintermüller, Multiobjective optimization with PDE constraints, International Workshop on PDE-Constrained Optimization, Optimal Controls and Applications, December 10 - 14, 2018, Sanya, China, December 13, 2018. M. Hintermüller, Multiobjective optimization with PDE constraints, 23rd International Symposium on Mathematical Programming (ISMP2018), July 1 - 6, 2018, Bordeaux, France, July 2, 2018. H. Heitsch, A probabilistic approach to optimization problems in gas transport networks, SESO 2017 International Thematic Week ``Smart Energy and Stochastic Optimization'', May 30 - June 1, 2017, ENSTA ParisTech and École des Ponts ParisTech, Paris, France, June 1, 2017. H. Heitsch, A probabilistic approach to optimization problems in gas transport networks, CIM-WIAS Workshop ``Topics in Applied Analysis and Optimisation'', December 6 - 8, 2017, International Center for Mathematics, University of Lisbon, Portugal, December 6, 2017. R. Henrion, On M-stationary condition for a simple electricity spot market model, Workshop ``Variational Analysis and Applications for Modelling of Energy Exchange'', May 4 - 5, 2017, Université Perpignan, France, May 4, 2017. R. Henrion, Probabilistic constraints in infinite dimensions, Universität Wien, Institut für Statistik und Operations Research, Austria, November 6, 2017. R. Henrion, Probabilistic programming: Structural properties and applications, Control and Optimization Conference on the occasion of Frédéric Bonnans 60th birthday, November 15 - 17, 2017, Electricité de France, Palaiseau, France, November 17, 2017. R. Henrion, Subdifferential characterization of Gaussian probability functions, SESO 2017 International Thematic Week ``Smart Energy and Stochastic Optimization'', May 30 - June 1, 2017, ENSTA ParisTech and École des Ponts ParisTech, Paris, France, June 1, 2017. M. Hintermüller, Generalized Nash equilibrium problems in Banach spaces: Theory, Nikaido--Isoda-based path-following methods, and applications, The Third International Conference on Engineering and Computational Mathematics (ECM2017), Stream 3 ``Computational Optimization'', May 31 - June 2, 2017, The Hong Kong Polytechnic University, China, June 2, 2017. M. Hintermüller, Total variation diminishing Runge--Kutta methods for the optimal control of conservation laws: Stability and order-conditions, SIAM Conference on Optimization, Minisymposium MS111 ``Optimization with Balance Laws on Graphs'', May 22 - 25, 2017, Vancouver, British Columbia, Canada, May 25, 2017. H. Heitsch, Nonlinear probabilistic constraints in gas transportation problems, WIAS-PGMO Workshop on Nonsmooth and Stochastic Optimization with Applications to Energy Management, May 10 - 12, 2016, WIAS Berlin, Australia, May 11, 2016. H. Heitsch, Optimization in gas transport networks using nonlinear probabilistic constraints, XIV International Conference on Stochastic Programming (ICSP 2016), Thematic Session: Probabilistic Constraints: Applications and Theory, June 25 - July 1, 2016, Búzios, Brazil, June 28, 2016. J. Neumann, The phase field approach for topology optimization under uncertainties, ZIB Computational Medicine and Numerical Mathematics Seminar, Konrad-Zuse-Zentrum für Informationstechnik Berlin, August 25, 2016. I. Bremer, Dealing with probabilistic constraints under multivariate normal distribution in a standard SQP solver by using Genz' method, WIAS-PGMO Workshop on Nonsmooth and Stochastic Optimization with Applications to Energy Management, May 10 - 12, 2016, WIAS Berlin, May 11, 2016. R. Henrion, Formules du gradient pour des fonctions probabilistes Gaussiennes, Workshop on Offshore Wind Generation, September 9, 2016, Electricité de France R&D, Paris, France, September 9, 2016. R. Henrion, Optimisation sous contraintes en probabilité, Séminaire du Groupe de Travail ``Modèles Stochastiques en Finance'', Ecole Nationale Supérieure des Techniques Avancées (ENSTA) ParisTech, Palaiseau, France, November 28, 2016. R. Henrion, Robust-stochastic optimization problems in stationary gas networks, Conference ``Mathematics of Gas Transport'', October 6 - 7, 2016, Zuse Institut Berlin, October 6, 2016. M. Hintermüller, S. Hajian, N. Strogies, Subproject B02 -- Parameter id., sensor localization and quantification of uncertainties in switched PDE systems, Annual Meeting of the Collaborative Research Center/Transregio (TRR) 154 ``Mathematical Modeling, Simulation and Optimization Using the Example of Gas Networks'', Technische Universität Berlin, October 4 - 5, 2016. M. Hintermüller, S. Hajian, N. Strogies, Subproject B02 -- Parameter id., sensor localization and quantification of uncertainties in switched PDE systems, Conference ``Mathematics of Gas Transport'', Konrad-Zuse-Zentrum für Informationstechnik Berlin, October 6 - 7, 2016. H. Heitsch, Optimization of booked capacity in gas transport networks using nonlinear probabilistic constraints, 2nd International Symposium on Mathematical Programming (ISMP 2015), Cluster ``Optimization in Energy Systems'', July 13 - 17, 2015, Pittsburgh, USA, July 17, 2015. R. Henrion, (Sub-)Gradient formulae for probability functions with applications to power management, Universidad de Chile, Centro de Modelamiento Matemático, Santiago de Chile, Chile, November 25, 2015. R. Henrion, Application of chance constraints in a coupled model of hydro-wind energy production, Charles University in Prague, Faculty of Mathematics and Physics, Czech Republic, March 6, 2014. R. Henrion, Application of probabilistic constraints to problems of energy management under uncertainty, Eidgenössische Technische Hochschule Zürich, Power Systems Laboratory, Switzerland, September 30, 2014. R. Henrion, Nonlinear programming for solving chance constrained optimization problems: Application to renewable energies, Winter School on Stochastic Programming with Applications in Energy, Finance and Insurance, March 23 - 28, 2014, Bad Hofgastein, Austria, March 25, 2014. R. Henrion, Probabilistic constraints in hydro reservoir management, XIII Symposium of Specialists in Electric Operational and Expansion Planning (SEPOPE), May 18 - 21, 2014, Foz do Iguassu, Brazil, May 19, 2014. R. Henrion, Probabilistic constraints via nonlinear programming: Application to energy management problems, Euro Mini Conference on Stochastic Programming and Energy Applications (EuroCSP2014), September 24 - 26, 2014, Institut Henri Poincaré, Paris, France, September 25, 2014. A. Möller, Probabilistic programming in hydro power management, International Conference Operations Research ``Mastering Complexity'', September 1 - 3, 2010, München, September 1, 2010. R. Henrion, A model for dynamic chance constraints in water reservoir management, 23rd European Conference on Operational Research (EURO23), July 6 - 8, 2009, Bonn, July 7, 2009. R. Henrion, Characterization of M-stationary points for an equilibrium problem in an electricity spot market model, 16th International Conference on Mathematical Methods in Economics and Industry, June 15 - 18, 2009, České Budějovice, Czech Republic, June 17, 2009. R. Henrion, On stationarity conditions for an equilibrium problem with equilibrium constraints from an electricity spot market model, 23rd European Conference on Operational Research (EURO23), July 6 - 8, 2009, Bonn, July 7, 2009. R. Henrion, On a dynamical model for chance constrained programming, Conference on Optimization & Practices in Industry (COPI08), November 26 - 28, 2008, Clamart, France, November 28, 2008. R. Henrion, Contraintes en probabilité: synthèse bibliographique et approche à la situation dynamique, Electricité de France R&D, Clamart, France, November 28, 2007.